Please note this post contains affiliate links, it doesn’t change the price on items featured. Happy St. Patrick’s Day! Well…almost. The celebrations have already started around here with parades and bars running specials. It’s a great time of year. My family always knew we had Irish heritage but recently it was discovered that we have a larger Irish ancestry than we originally realized so this years holiday is extra special. My mom always made corned beef for St. Patrick’s Day but I was never a real fan of just the plain corned beef and cabbage. A few years ago I was at an Irish festival in Milford, CT and I had myself a corned beef reuben. This sandwich was everything, no lie. Absolutely delicious. 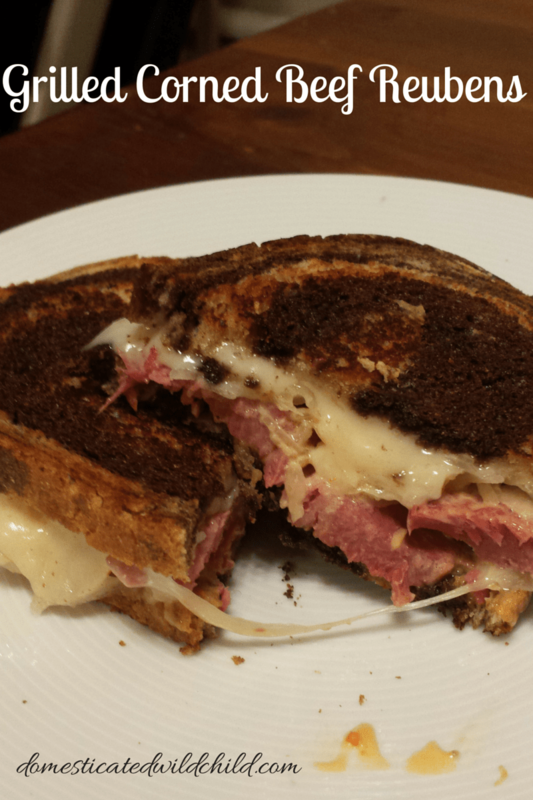 When I thought about doing something with corned beef I immediately thought about that reuben. I wanted to attempt one on my own. This version was so good, I had two! This recipe makes 4 sandwiches, keep that in mind when you are shopping. 1) Put a large pot of water on the stove and set to boil. Once at a roaring boil, put the corned beef into the pot, lower to a simmer and cover. Simmer for an hour a pound. I cooked this brisket for two hours to ensure tenderness. 2) Once the meat is done, carve it into slices and let sit until ready to add to sandwich. 3) Spread butter on one side of each slice of bread. Tip-you can also use mayo, which has a higher burn rate and could make your sandwich super melty, see more information here. 4) Place slice, butter side down, in a medium high hot skillet. Add cheese, corned beef and sauerkraut. Spread a liberal amount of thousand island dressing on the other side of slice number two and top the sandwich. 5) Grill both sides until golden brown. Remove from pan, slice in half and serve. Enjoy and Happy St. Patrick’s Day!!!! Put a large pot of water on the stove and set to boil. Once at a roaring boil, put the corned beef into the pot, lower to a simmer and cover. Simmer for an hour a pound. I cooked this brisket for two hours to ensure tenderness. Once the meat is done, carve it into slices and let sit until ready to add to sandwich. Spread butter on one side of each slice of bread. Tip-you can also use mayo, which has a higher burn rate and could make your sandwich super melty. Place slice, butter side down, in a medium high hot skillet. Add cheese, corned beef and sauerkraut. Spread a liberal amount of thousand island dressing on the other side of slice number two and top the sandwich. Grill both sides until golden brown. Remove from pan, slice in half and serve.